For those that have used the Google Keywords Tool for organic keyword analysis, it is time to find another more accurate tool. It seems that Google is only generating “Commercial” data through the tool and no longer giving us the full scope of keywords in its index. This could be an attempt on Google’s part to hold back data so that we do not get “too good” at finding those niche keywords or it could be an attempt to get users to try out Google Adwords as a preferred way to boost your business (rather than getting top targeted results organically). How does this effect keyword analysis? Lets say for the sake of this test that we have a client that is trying to promote his new book on “Soccer Tricks”. Although he may be using this keyword commercially, Google has decided that this word is non-commercial so therefore will not even recommend it in the keyword tool. What keyword tool should I use? Wordstream: Now the better tool on the market. I use the SEO for firefox plugin that analyses the content of my page. Wordstream is a hard to navigate site with far to much lead in advertising and believe me when I say IT IS NOT FREE. Prices range from $49-$399 per month. Wordtacker: Although not free this tool offers a great list of suggestions. Does not do well on SA results though. Google’s auto-complete feature in search can give some very good suggestions so match those suggestions to one of the tools mentioned above to get some trendy keywords. Use more than one keyword tool to get a good analysis of the keywords. If you have the money then I recommend using Rank Trackers ($99) built in suggestion tool that uses multiple sources to determine what keywords to suggest (Including Wordtracker). Secondly, if you write articles naturally then there is a good chance that the keywords that you are using in the article already contain some trendy topics. Nothing beats solid content! Why Bing is Useless in South Africa? SEO Company vs SEO Individual | Who to hire? We have been finding it harder and harder to good good solid research done with the Google Adwords keyword tool. Apart from the example of complete exclusion you mention above, search volume data is inconsistent and very inaccurate at times. 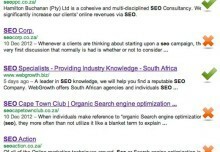 We focus most of our SEO efforts on Local (South Africa) SEO projects so the country targeting of the google tool is its best feature, we are yet to find any other Paid or free keyword research tool out there that allows for finding SA based search volume data. Any suggestions? Unfortunately this is a common problem. If there are any developers out there that can come up with a tool that can handle local SA based search data please do start developing, you can be sure that I will be the first person to test drive it. It seems like google is trying to make life hell for the smaller guys. No idea what their thinking is behind all their latest changes but it certainly is slowly driving away customers. Especially the small guys now have to look to alternative sources for traffic and where to spend their paid advertising dollars. Hey Bryancame across this problem on this side of the Pond too. We researching Market Samurai now as a possible solution after trialling word stream, word tracker, trillian (puke – pretty lame.) and Keyword Spy as well.Will let you know what else pops up. Have things changed a lot since you posted this back in ’10? Looking for a good keyword tool for SA. Why Are You Getting Below Average Exp CTR when Actual CTR is High? Manali New Year Party 2016 on SEO Expert vs SEO Specialist | What is The Difference?